A clock with a twist: the face is partitioned into day and night, showing at a glance how many hours of each are remaining. It also shows sunrise, solar noon, sunset, twilight, and moon visibility – all accurate for today at your current location. You can add the TerraTime Clock to your device's home screen as a widget, giving you at-a-glance access to its features - as well as the current time, of course. The basic TerraTime Clock is an ordinary analog clock face, with a sky blue band that shows the hours of daylight each day. It's read from the clock's numbers, as the hour hand (the short yellow one) moves around the arc. Twilight appears as the darker blue at each end, while the rising and setting sun is shown at the correct time on the edge of the face. Solar noon is shown with a small midday-sun icon. Near the edge of the clock face is an icon showing the current moon phase, at the correct angle for your latitude and season, and its position on the clock dial shows the time of "lunar noon", when the moon is at its apex. [If lunar noon doesn't occur on the current clock face, the phase icon will simply appear at the noon/midnight location.] The gray bar behind the moon icon shows the time period when the moon is visible in the sky. 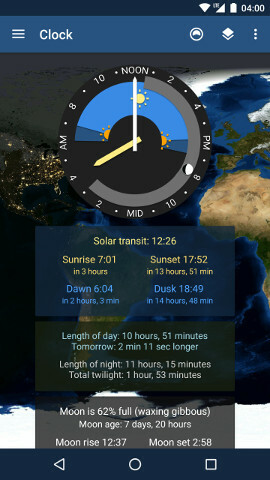 The clock activity (shown left) also displays specific data for sunrise, sunset, and length of day and night, as well as moon phase, rise, and set. Tapping any of the moon data fields will open our Moon Phase Pro app, if installed. The clock has options for a 24-hour mode which shows the entire day/night cycle for the current day, and which (in our opinion) is more pleasing than a conventional 12-hour clock. However, it does take a bit of mental adjustment when reading the time; the angle of the hour hand won't generally be what you expect for a given hour. Instead, you need to look at what numbers the hour hand is pointing near, and read the hour from there. Alternatively, you have the option of taking the numbers off completely, if you prefer a clean look. The image to the right shows an example of the TerraTime Clock widget, which enables you to add the clock directly to your Android home screen. It's available in multiple sizes and is included with the app; for instructions and details applicable to you, please refer to the correct section below. Be aware that a few devices, notably the Kindle Fire series, do not support widgets at all. 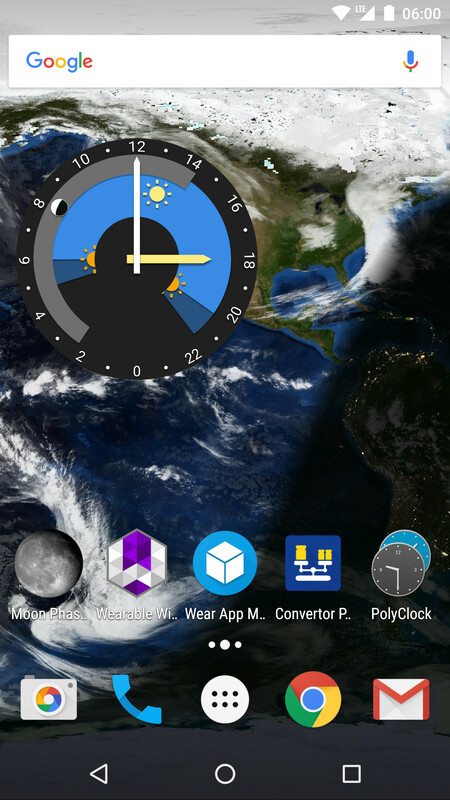 Long-press in an empty area of your home screen, select Widgets, and scroll to TerraTime Clock. All styles are resizable and scrollable. Open the app drawer (usually an icon like this ), select Widgets, and scroll to TerraTime Clock. 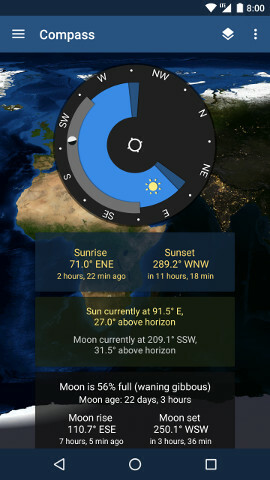 A variation on the TerraTime Clock is called Compass Mode, accessed through the app's navigation menu. It displays a live compass dial showing the direction to the sun and moon, as well as their rising and setting points. The face of the Compass uses the same color-coding as the Clock – sky blue for the region of the sky where the sun is above the horizon, and black where it's below. The analogous information for the moon is shown with a gray line, again like the Clock. A pair of small icons shows the current direction and apparent altitude of both the sun and moon. When either is below the horizon, their direction is still shown, but they'll be outside of their respective "visibility" arcs. This same data is also available in the text fields surrounding the compass dial. And naturally, Compass Mode uses your device's hardware compass to align its display with the real world. When you want to switch back to Clock Mode, just use the same menu item. Be aware that phone compass hardware can sometimes get out of alignment, causing TerraTime's Compass display to be off by some amount. If this happens, you can recalibrate it by waving your phone in the air in the shape of a figure 8 a few times. And any case, remember that Compass Mode is no more accurate than the hardware in your device, which probably isn't perfect.